'Villa Estiu' is built 1989 in genuine Provence style. Peaceful location south. On two levels: 1st level master bedroom (bed 180 x 200cm) with separate bathroom, dining room, kitchen, sitting room with fireplace with televison CD-player DVD satellite box. Separate from this, a section with 2 rooms (bed 160 x 200cm) and (bed 140 x 190 + 90 x 200cm) with a big bathroom in between with bath tub and shower. Separate room with washing machine. From ground level magnificant view to the mountains. In clear weather the sea as well. 2.level:lOne open office with desk and wireless internet connexion (free). One guest bath (shower) and toilet. Futhermore - one master bedroom with bed (160 x 200)and bathroom (shower and bath tube). Further more a separate terrace in connexion and magnificant view to mountains/sea. 15 min walk to Bargemon, 45 min to the Mediterranean coast. 1.5 hours to ski in winter. Good parking and bouledrome on the ground. Final cleaning, linen towels and electricity included. We are a danish couple, who have had a 'Summer house' in DK for many years. In spite of this we have been in Provence many times with our children. In 2005 we thought it would be a good idea to get a house in Provence, and we felt it was too noisy and too expensive to be down the coast. We chose Bargemon because we knew the village. Our family love to stay there, both in the high season and in winter time where the climate is mild. 2nd level guest toilet with shower, master bedroom toilet with shower and tube. 1st level master bedroom with toilet, shower. In between 2 sleeping rooms, big toilet with bath tube and shower. 2-3 skiing areas 1-1½ time drive from Bargemon. Notes on accommodation: Electric heating and closed fire place, firewood can be arranged. Separate pool area and play ground for child. Many olive trees giving shadow. Petanque (boule) field separately on the ground. Concerning walk to the village - Description: When you go from the house, turn to the left and keep to the left - there is a path following the mountain with view to valleys and to Bargemon- time, app 15 min. Outside: Lovely garden with many plants. Automatic watering. Plenty of sun chairs. Pool dimension 10 x 5 meters max depth 1,90 meter in the east -end. In the west- end steps and a child comfortable depth. Pool-maintance twice a week. Normally in function from beginning of May to middle of October. Barbecue-portable. Portable parasol. Utility Room: Modern Danish sofas, classical French furniture. TV with Satellite, DVD, radio, CD player. Free ADSL wireless internet. Cleaning / Towels / Linen / Maid service: Final cleaning when leaving. Towels, linen included. Key and instruction of the house included. When staying in longer periods, is it possible to get further cleaning, linen, towels etc-separate cost for this service. Other: Concerning the house location: The villa is located next to a genuin mountain road asphalted, at the near end of it. No passing - through traffic. Big, closed plot. "Villa Estiù" means "summer villa", Estiù is old Provence language for new French ètè. Marvellous place for families to spend their holidays. You can have all the privacy you want. My daughter and I spent a lovely week in Bargemon at Hans' villa. It's such a gorgeous area, and the villa was wonderful, especially the pool and the outdoor spaces. The weather cooperated and we were able to open the house up to the smell of jasmine from the terrace, and even though it was a little early to enjoy the pool we did anyway. The village of Bargemon is so nice, with a well-stocked market and a boulangerie and very nice cafes for dinner or pizza. It's a little bit of a drive to Cannes, Nice, etc. but its so worth it to come home to the villa. Stock up on rose, bring your sunscreen and a copy of A Year in Provence, plan to visit the markets in the neighboring villages and see the Gorges du Verdon. You'll need a car, but the driving isn't bad, just be careful on the curves. The neighborhood is quiet and private, Patrick was wonderful to meet us and show us the way to the villa, everything was clean and as pictured. The beds were comfortable and the view incomparable. 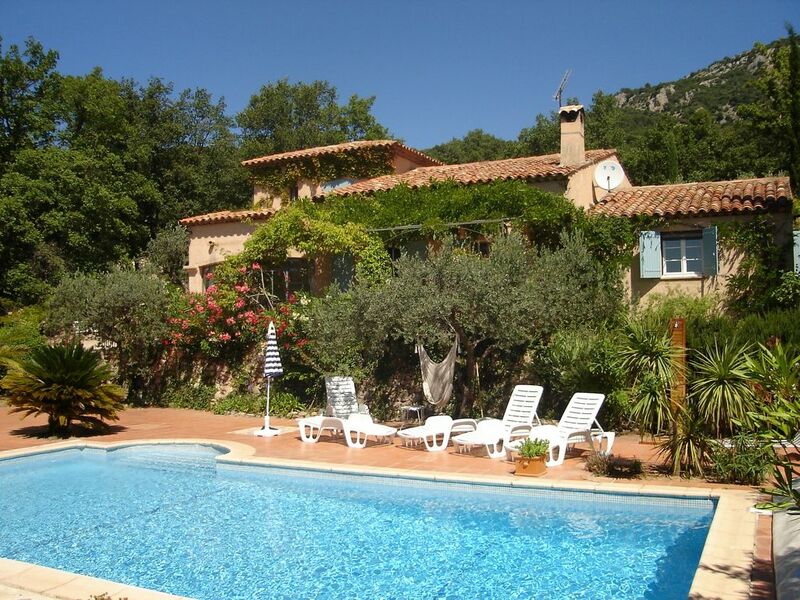 Old charming, big and wonderfull Provence house. Surrondings stunning. We stayed 4 weeks, and allmost everything about the house and surrondings vere amazing. We absolutely loved it. The House is very, very well equipt, charming funitures in Provence style and overall - inside and outside - were very charming. Pool area absolutely super, and the wiew over the montains is to die for 😁�. We would absolutely like to come back, and spend time here again. Hopefully for furher more than 4 weeks next time. The orners has been very helpfull and friendly, and We have been more than satisfired. Sehr schönes Haus mit Blick auf die Berge in sehr schöner Umgebung . Very nice place to spend holydays !!! Mediterranean coast 45 min from the house. St Tropez 1 hour. Nice 1 hour. The wonderful "Les Gorges du Verdon" (Grand Canyon) 1 hour from the house.